Facebook has named Oreo number one in its list of 20 brands being celebrated for their creative work. Oreo won for its Daily Twist campaign, which produced 100 pieces of work in 100 days to celebrate the brand's centenary. Oreo had a stellar year in terms of digital marketing in 2012 and scored a string of notable hits. Those included its hotly debated gay pride post, which formed part of its Daily Twist campaign. Other winners of the Facebook Studio awards included Graubunden Tourism, TNT, Allstate, Heineken, Nike UK, AT&T, Ford and Universal Studios. The brands won for showing the best use of creative work on their Facebook pages rather than applications or Facebook ads. The Oreo Daily Twist campaign, which won the top Blue Award was created by Draft FCB in New York and really showed just how consistently creative a brand could be in social media by creating work that was consistently engaged with by its audience. The Oreo team looked to the world around it to take inspiration and picked current affairs topics and news stories. Some of those, like its gay pride ad, were hugely controversial while others, such as 'Talk Like a Pirate Day' and the Mars Rover landing, were fun or educational, but all revolved around reinterpreting an idea through the playful eyes of Oreo. The campaign culminated in a final 'Twist' that was crowdsourced in Times Square and produced live in a virtual pop-up agency. The concepts and images proposed by fans were projected on a massive Times Square billboard so fans could pick their favourite and track its progress up through the final posting: 'The Anniversary of the High Five'. The campaign scored Oreo masses of media coverage ranging from online and press, to ABC News and 'Jimmy Kimmel Live'. All this was achieved without media support for the first month of the campaign. 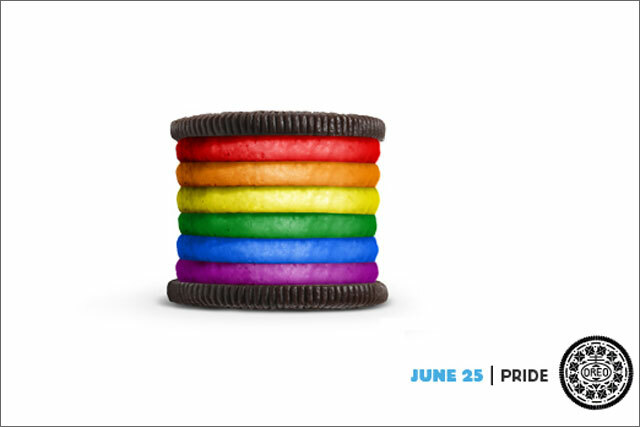 The campaign easily exceeded Oreo's engagement goals and racked up 1.3 million Facebook interactions and saw the number of fans jump from 26 to 27 million in the 100 days of the campaign. Its fan count has since risen to more than 33 million. There were five gold award winners, they were: Graubunden Tourism for 'A Little Village goes Global' created by Jung von Matt/Limmat; Turner Network Television for Dallas; Allstate Insurance Company 'Mayhem 2012 created by Leo Burnett; Nike for Nike Academy by AKQA; AT&T 'You've got a case' by BBDO; and Ford '2012 Mustang Customiser' by WPP Team Detroit.